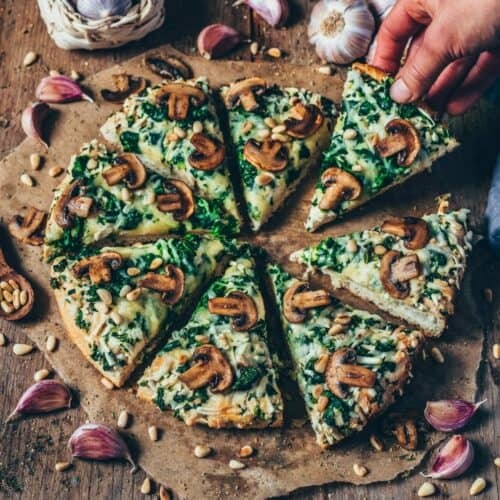 This cheesy vegan garlic mushroom and spinach pizza is perfect when you want a quick dinner that’s not only delicious, but also healthy! 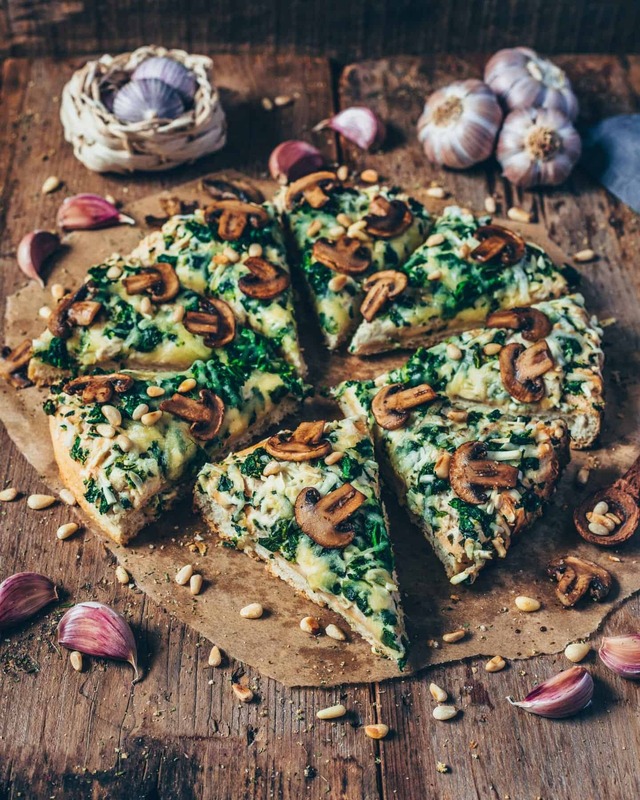 This recipe is simple, and it’s the best pizza you will ever have! Sometimes I just really need pizza, and by sometimes, I mean almost every Friday night! I’m not sure who came up with #pizzafriday, but for me everyday is a good day for pizza! 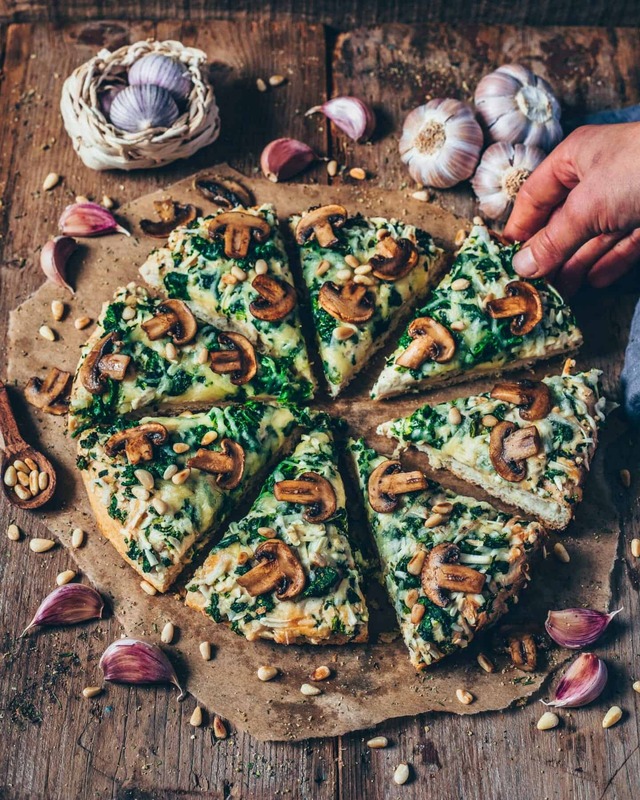 Especially when it’s an easy to make and delicious pizza, like this cheesy vegan garlic mushroom and spinach pizza with toasted pine nuts. I like it best when it’s made with my homemade best pizza dough, but sometimes I switch it up for easy pizza toast. Also, if you make your own pizza dough in advance and store it in the freezer, you can be having homemade pizza in less than 20 minutes! I mean, how amazing is that?! 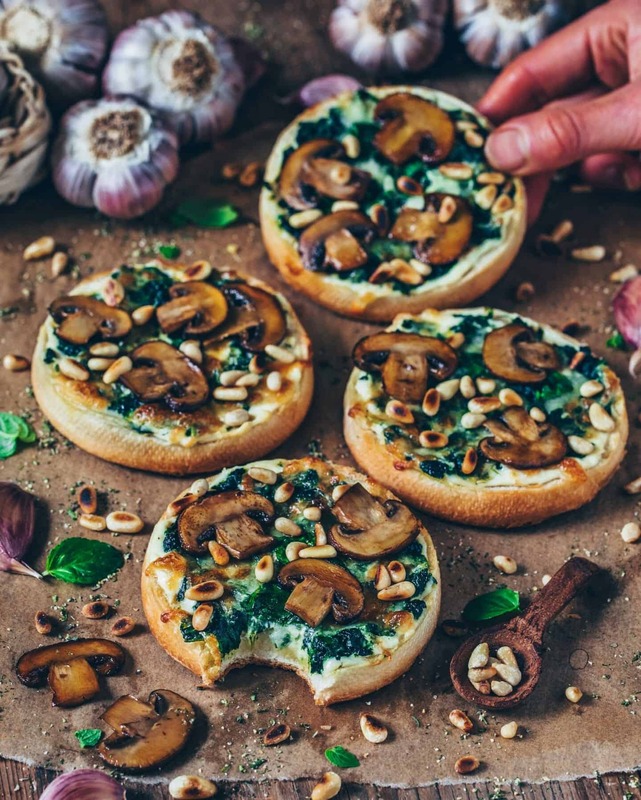 This Garlic Mushroom and Spinach Pizza is quick, easy and healthy! If anyone were to ask me what my all time favorite food is, my answer would definitely be Pasta, Ravioli, Gnocchi, and of course PIZZA! I’m a little bit obsessed with these kinds of foods, they’re so delicious. However, that’s not such a big problem because you can make everything healthier by using plantbased ingredients and adding lots of vegetables. I don’t think it can get any better when meals are healthy but still super tasty, right? 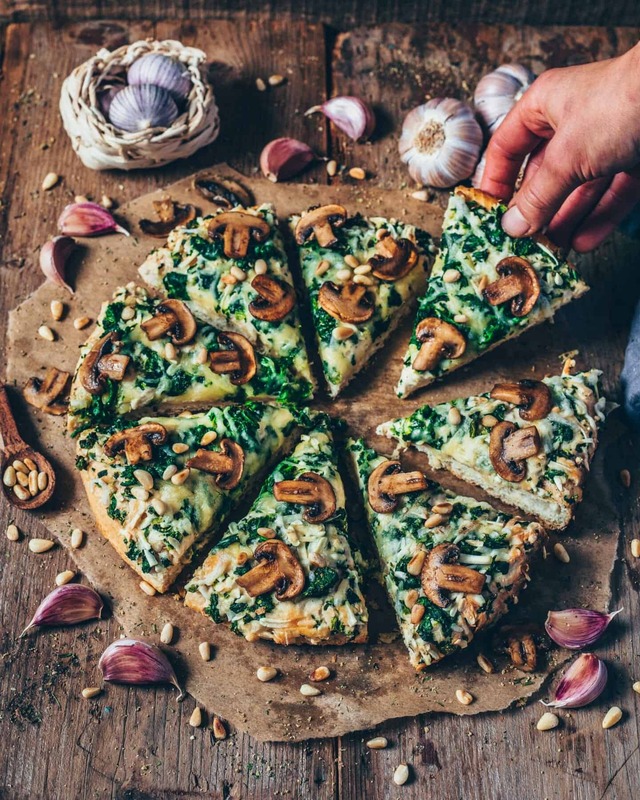 This vegan Garlic Mushroom and Spinach Pizza is plantbased and contains no dairy ingredients and no saturated fats. To make the topping (spread), I start with the spinach cream. 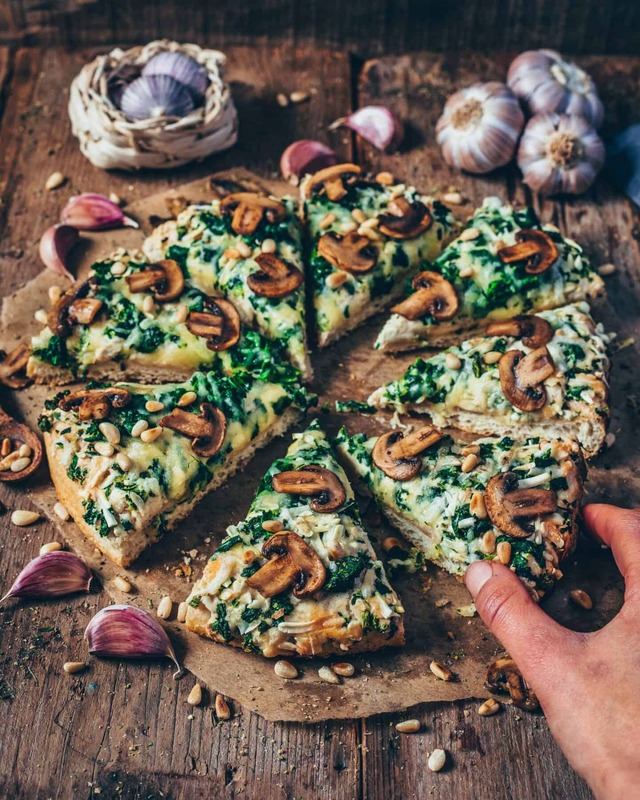 It’s simply made of fresh spinach (frozen spinach will do too), vegan cream cheese (you can also make your own cashew ricotta) and some spices. This mixture creates a creamy base on your pizza before going into the oven. 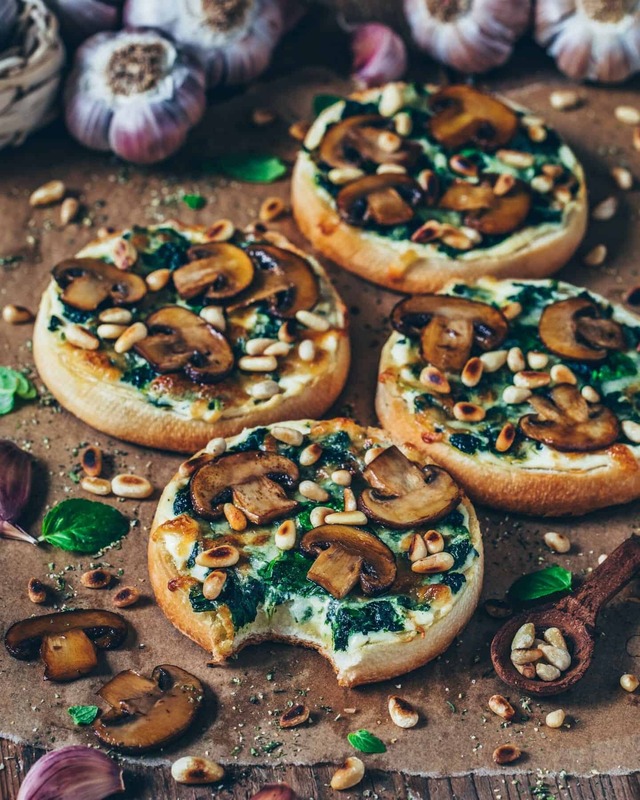 I also added roasted garlic to the cream cheese which gives your pizza amazing flavors! Granted I like to add quite a lot of garlic but when you roast garlic the flavor becomes a lot milder. 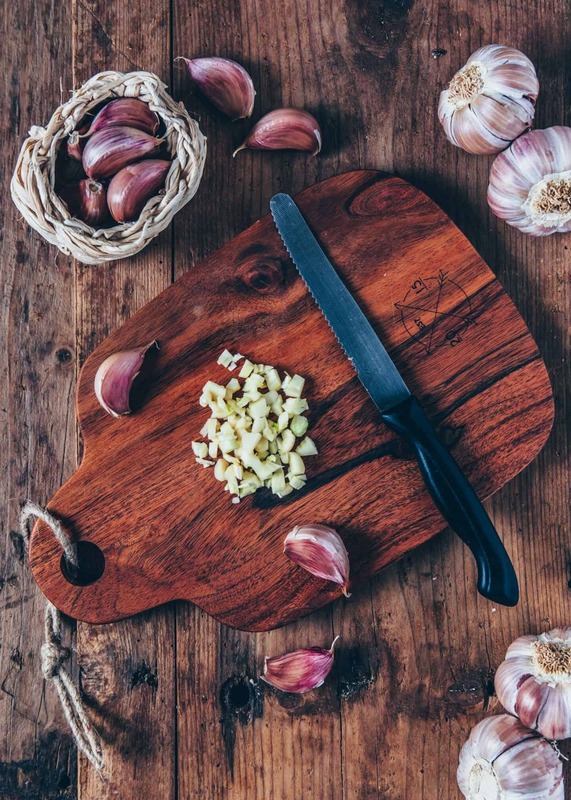 Don’t be afraid of using more garlic in this recipe, well unless you don’t like garlic. 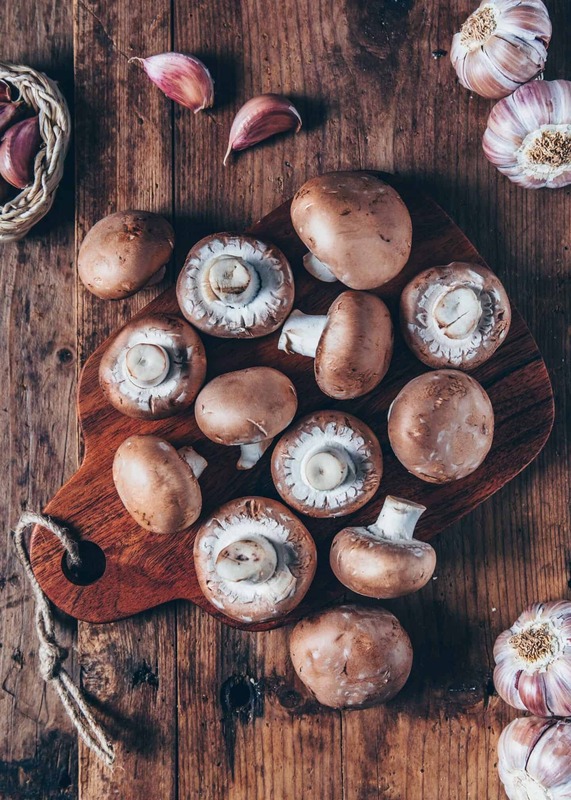 While the pizza is baking, pan-fry the mushrooms. Honestly, I don’t like baked mushrooms so much because they usually get dry and tasteless when you just bake them. If you take a look in my freezer, I guarantee that you’ll find at least one frozen homemade pizza dough in there. I usually make a big batch and freeze it, so I always have pizza dough on hand for those inevitable pizza cravings! Of course, there are times that I forget to prepare new pizza dough, or I forget to defrost it, in which case I simply use bread, a baguette or toast as a base for my pizza. If that spounds good to you, check out the recipe for my easy vegan Pizza Toast. The perfect simple recipe for any occasion! 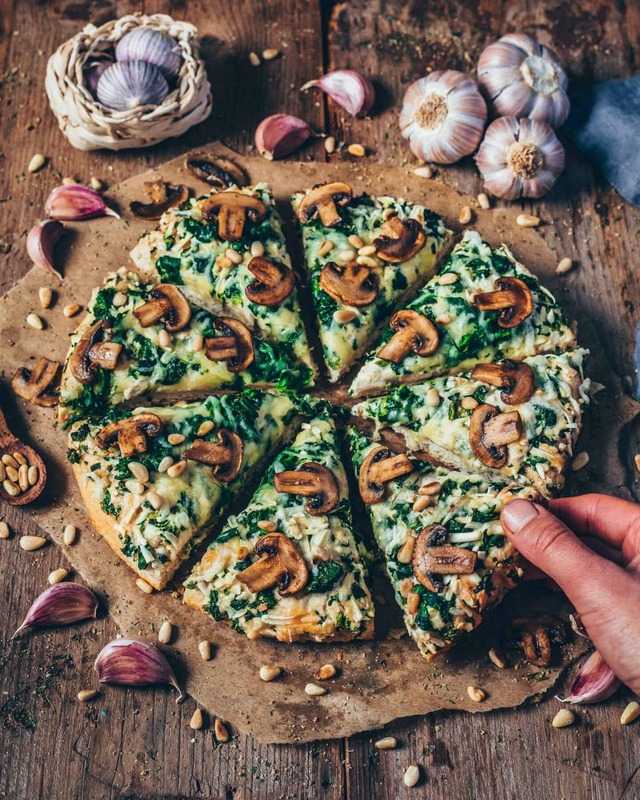 This cheesy vegan garlic mushroom and spinach pizza is perfect when you want a quick dinner that's not only delicious, but also healthy! 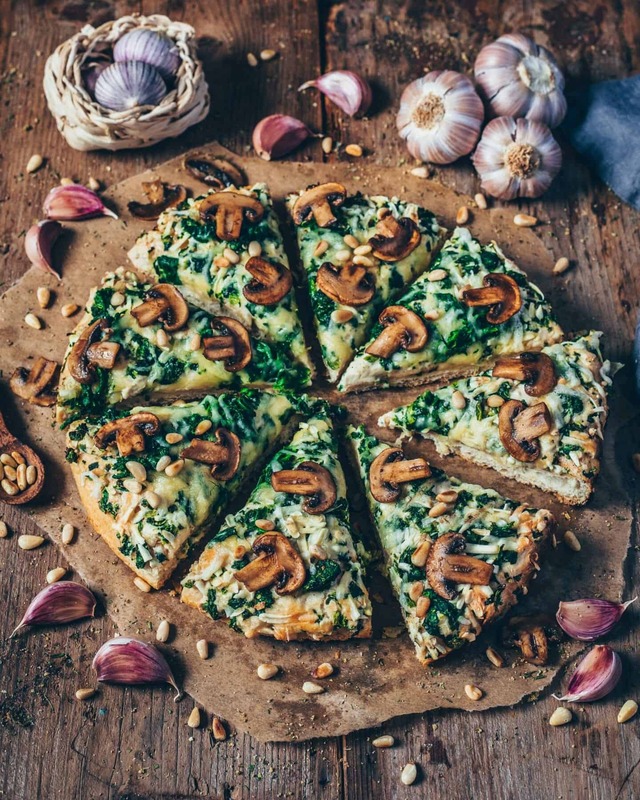 This recipe is simple, and it's the best pizza you will ever have! Roll out your pizza dough with a rolling pin. Place the pizza dough onto a baking sheet lined with parchment paper. (You can also use a pizza pan or pizza stone). If using frozen spinach, simply thaw and squeeze the liquid. 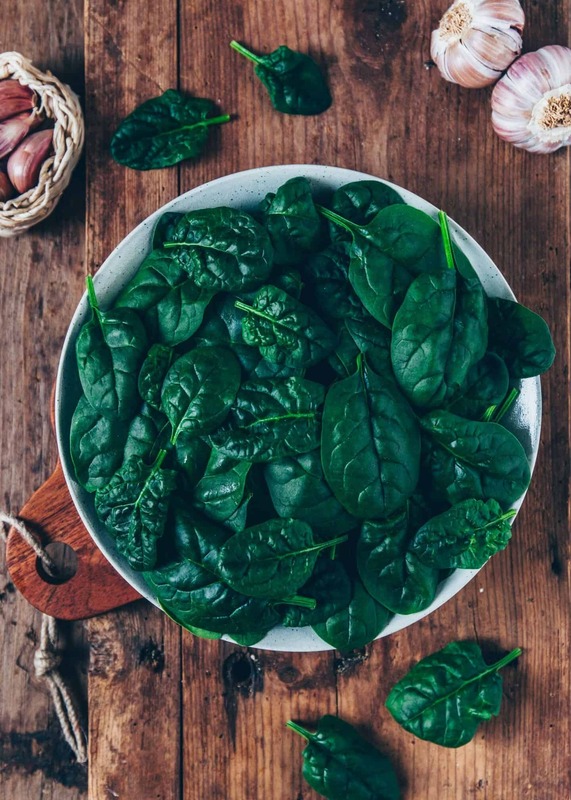 If using fresh spinach, bring salted water to a boil in a pot. Add spinach and cook for 1-2 minutes until it starts to wilt. Then squeeze the spinach well and chop roughly. Heat up a little oil in a small pan and roast garlic for 30 seconds while stirring. Then add the cream cheese along with the spinach. Season with salt and pepper to taste and stir to combine. Spread the spinach cream mixture over your pizza dough followed by vegan cheese. Bake the pizza for about 10-15 minutes until cheese is melted. 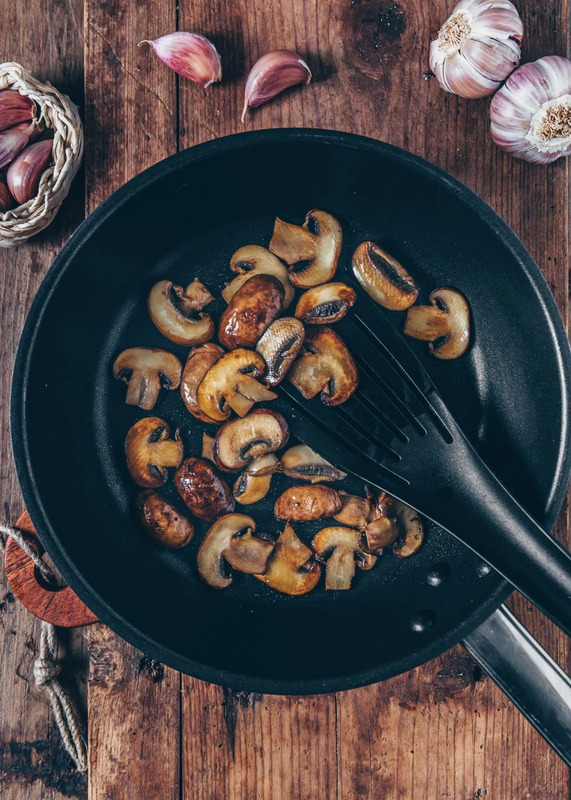 In the meantime, fry mushrooms in a pan with some oil for 6-8 minutes until golden browned. Add a little salt to taste. 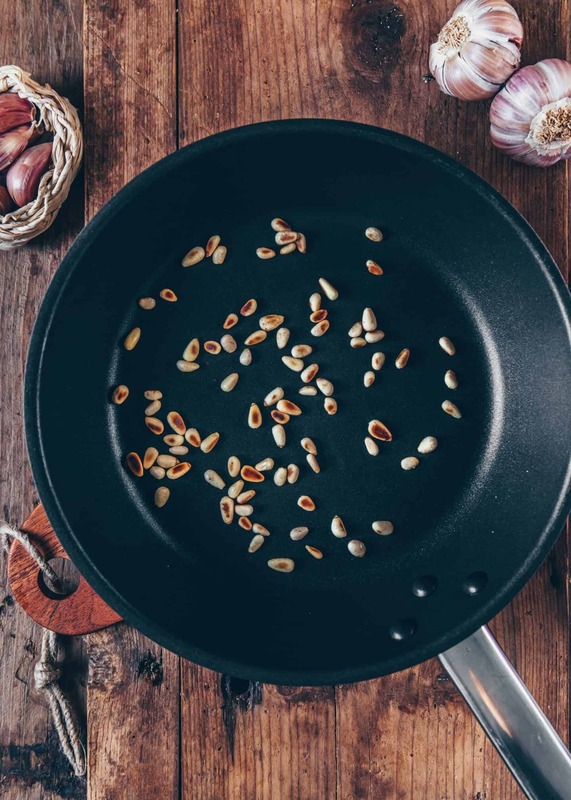 Toast pine nuts in another pan without adding any oil. 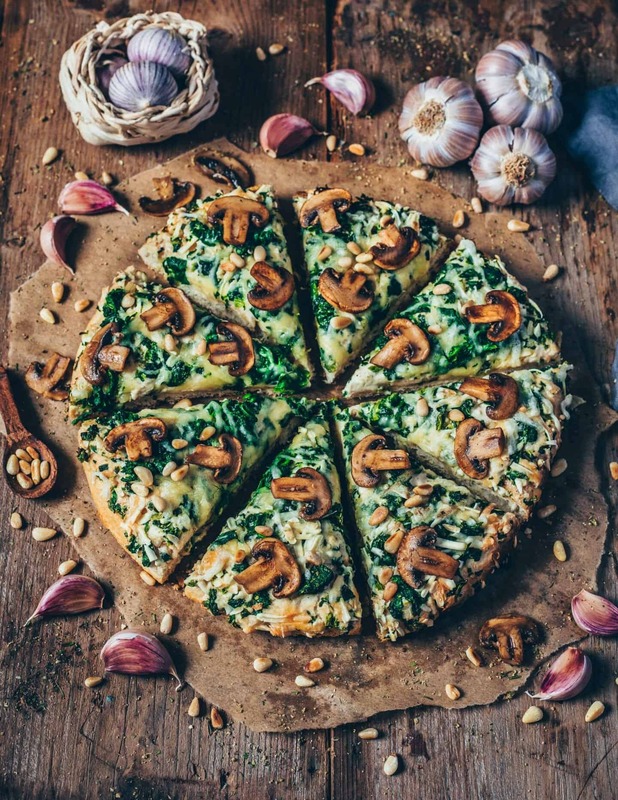 When your pizza is done top with mushrooms and pine nuts if using. You can make your own homemade pizza dough with this recipe, or using store-bought pizza dough, or your favorite bread to make pizza toast. 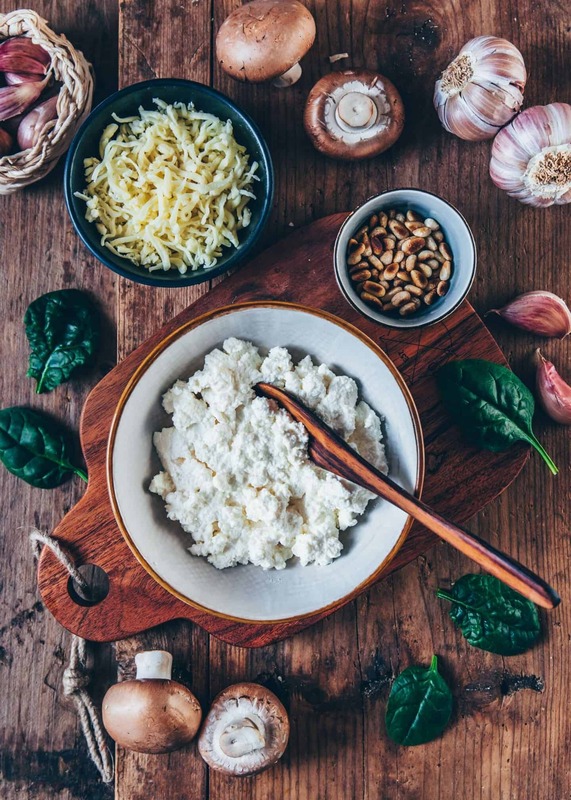 You can either use store-bought dairy-free cream cheese / ricotta/ crème fraîche, or make your own homemade cashew ricotta with this recipe. I made this. It’s so easy and it was absolutely delicious. My boyfriend loves eating meat but even he asked me to make more of this haha. I highly recommend this recipe. So glad to hear that also your boyfriend liked the recipe! This pizza looks bomb! 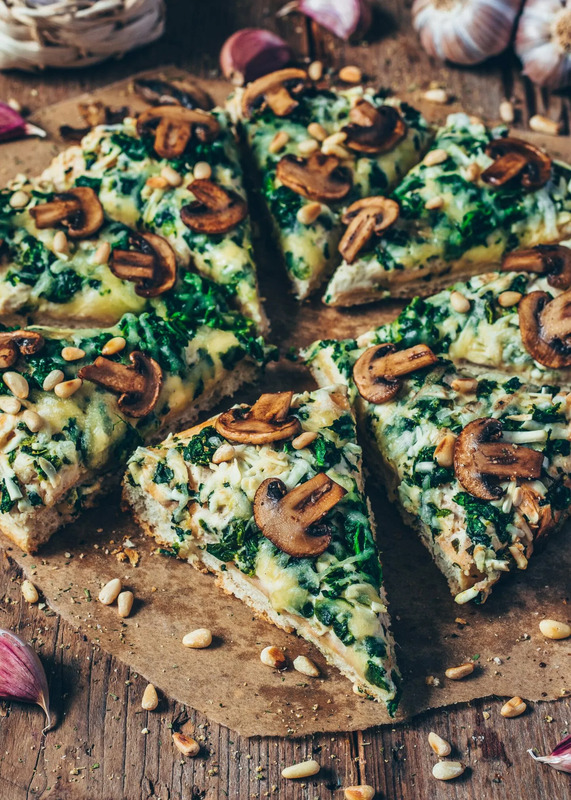 I love pizza with spinach and mushooms. Thank you so much that you like my pizza! So glad that you liked this recipe! So happy that you liked the recipe! This pizza was incredible! So full of flavor and loaded with all the best veggies! It was so good that this will go into my regular recipe rotation! I changed it up just a little by adding some chickpeas spiced with Buffalo sauce on top- just enough heat to round out this dish. Thank you Bianca! It’s toooo yummmy first time I try like this delicious pizza ❤️😍😍 thankk u!! Can you simply Sautee the spinach and use it that way? Yes, sure but I recommend to drain it well and combine with cheese before adding it on top of your pizza. Made this for dinner last night and it was absolutely amazing! So flavourful. I definitely recommend that everyone tries this out!